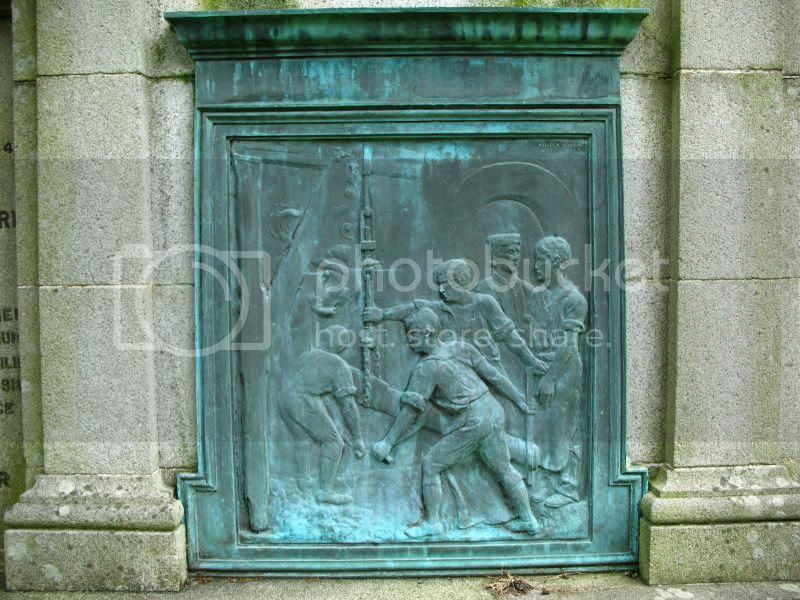 1856 – Born Glasgow, Father was an art metal worker, his brother a landscape artist. Gained bursary and travelled to London to study under Belgian Professor Edouard Lanteri at the South Kensington College. Devoted much time to metal working and became a member of the London Guild. 1910 Bust of Alexander Smith the Kilmarnock poet and essayist, also bronze group on exterior niche of City of Glasgow Friendly Society Offices, Douglas Street, Glasgow. 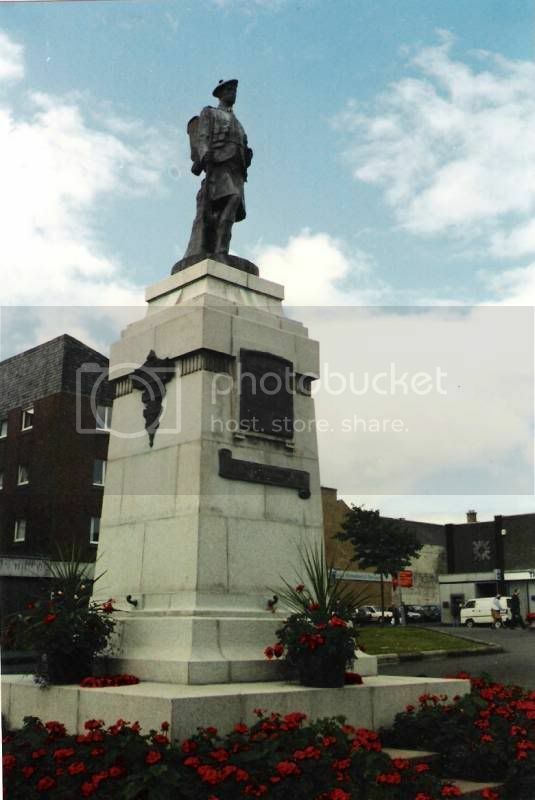 1913 Full scale bronze statue of Dr. David Livingstone for niche on exterior of the Livingstone Memorial Church of Scotland, Blantyre. 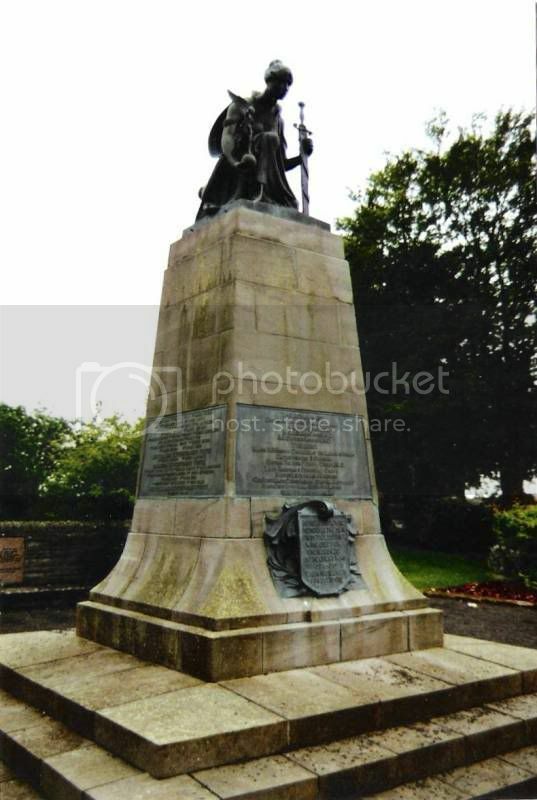 1921 Largs War Memorial unveiled 18th September. 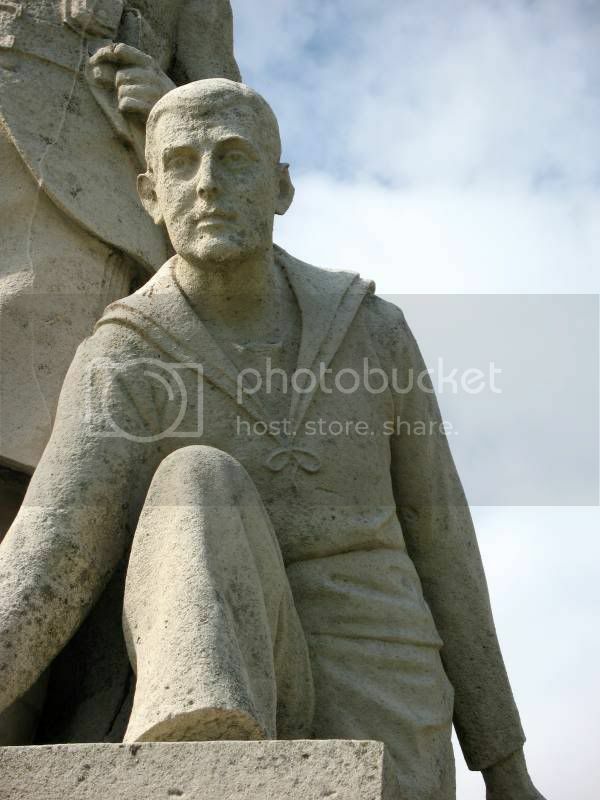 The sculpture is unusual in being carved from a white freestone which looks rather like Portland Stone. It is showing signs of weathering, its location being particularly exposed on the sea front. 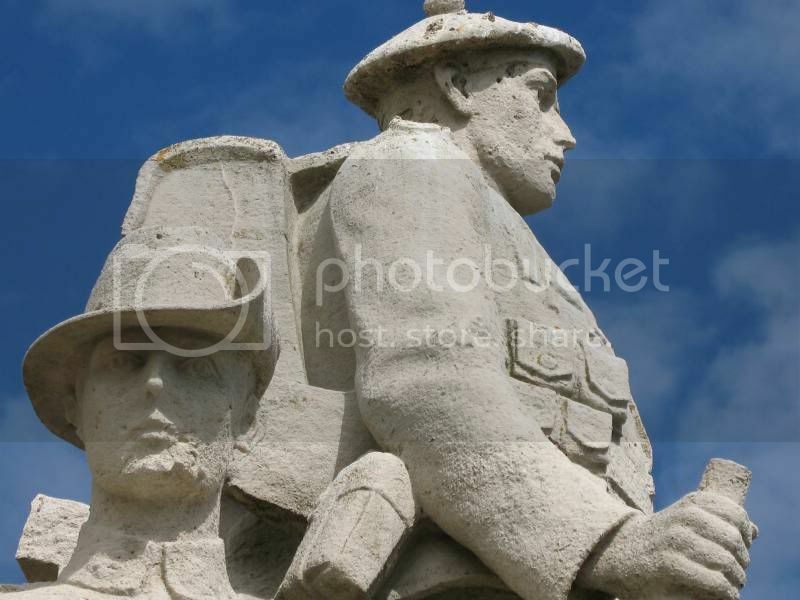 20th February 1934 – Died of heart attack in Cambridge Street while making his way to his studio at 152a Renfrew Street having almost completed a ‘colossal’ plaster maquette of Robert Burns. The clay model was later purchased by the Hamilton Cronies Club for their headquarters in McGhie Street, Hamilton. As well as sculpture Brown was interested in embossed metal work and had a lifelong interest in the life and work of Robert Burns. Bronze statuettes ‘The Ballad Monger’, ‘Four Score Years’ and ‘The Thresher’ in Kelvingrove Art Gallery; and ‘The Wrestlers’ which is held by The Tate Gallery in London. Other bronze statuettes include ‘The Guddling Boy’. Other works include a marble portrait bust of Jean Armour. Good stuff. I'm going to peruse this when I have more time. 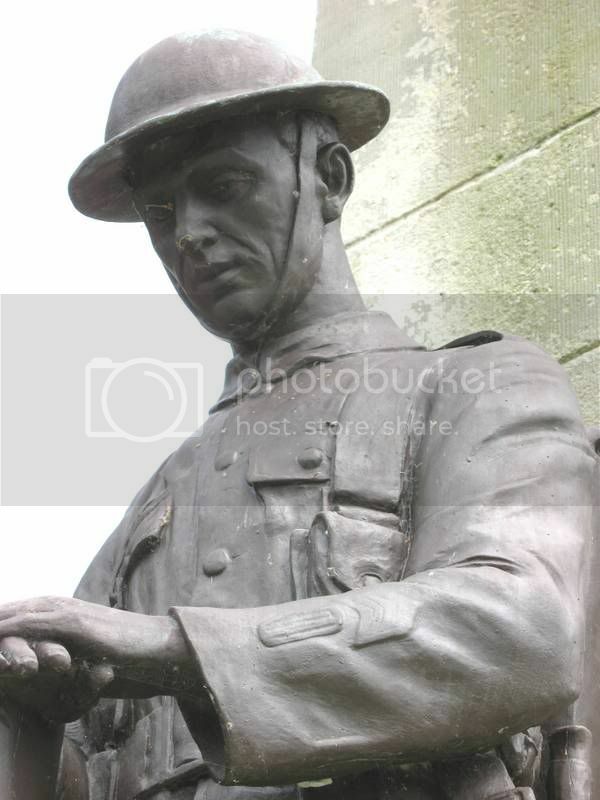 Just to quickly say Kellock Brown was also responsible for the War Memorial in Alyth, Perthshire. 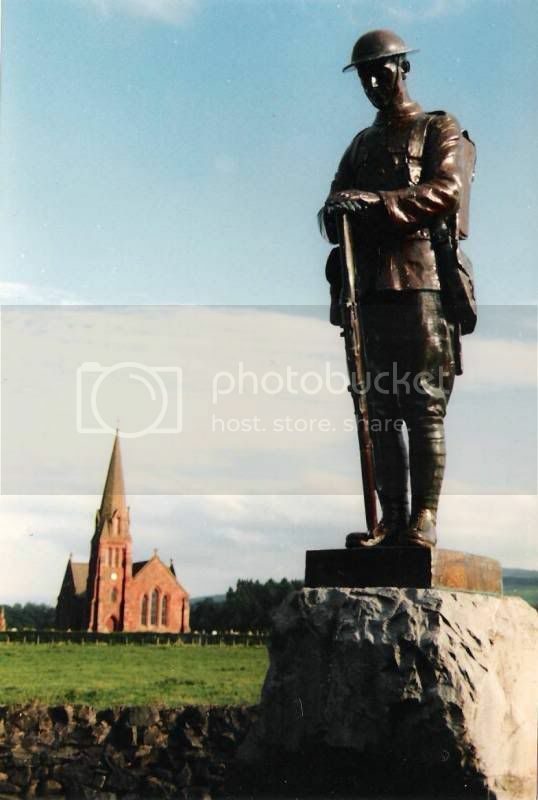 Only just recently the 'Alyth Voice' reprinted an article by a local minister written some years ago taking a stab at describing and trying to explain the symbolism of the memorial. I wish I had photocopied it at the time but there was a lengthy article in the Alyth Gazette & Guardian around the time of the unveiling which holds all the answers. I'm sure I spotted Brown's signature on this memorial when I photographed it, but that was a few years ago and I must have lost my notes. I've added a pic above. Its surprising, you would think this was a fairly important commission for any artist and yet there isn't a mention of it in any of the records I have on Kellock Brown. Managed to get a transcript of the article from the Alyth Voice, I 'may' be getting things confused here. It suggests the article was lifted from the Alyth Guardian. This may be the one I read which tends to leave people to make their own interpretation rather than giving an answer. As I say I'll have to check back sometime. You may know a little more about Kellock Brown's thought process but I think it is an interesting piece anyway. Alyth War Memorial - extract from the Revd James Meikle’s book ‘Places & Place-Names Round Alyth’ 1925. 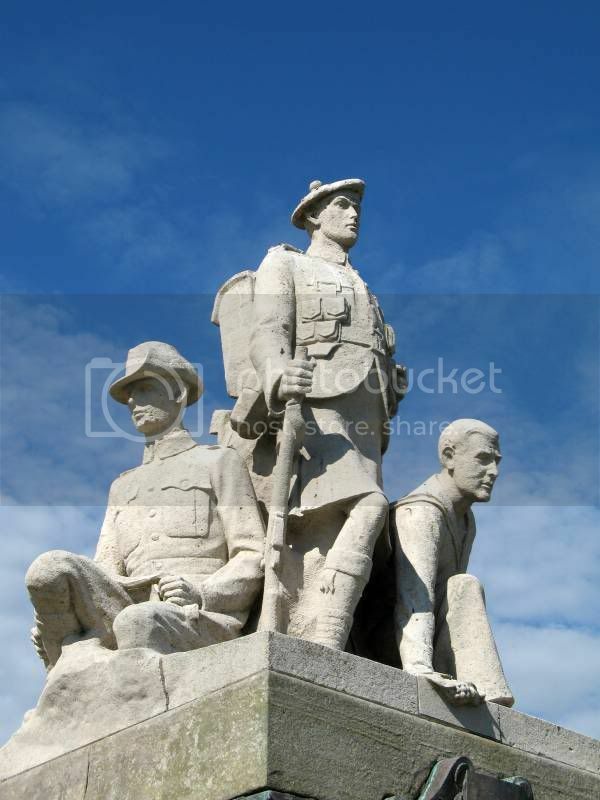 In the arresting War Memorial, by Mr. Kellock Brown, Sculptor, Glasgow, which stands at the corner of the Muir, there is much to be seen; the following extract from the Alyth Guardian will help to suggest ideas and to increase appreciation. “What is meant by the figures of the monument? What are the ideas intended to be conveyed especially by the larger figure? It is evident that the whole statue is full of symbolism, and that the sculptor has presented not an ordinary commonplace but a rare piece of statuary. It challenges thought. 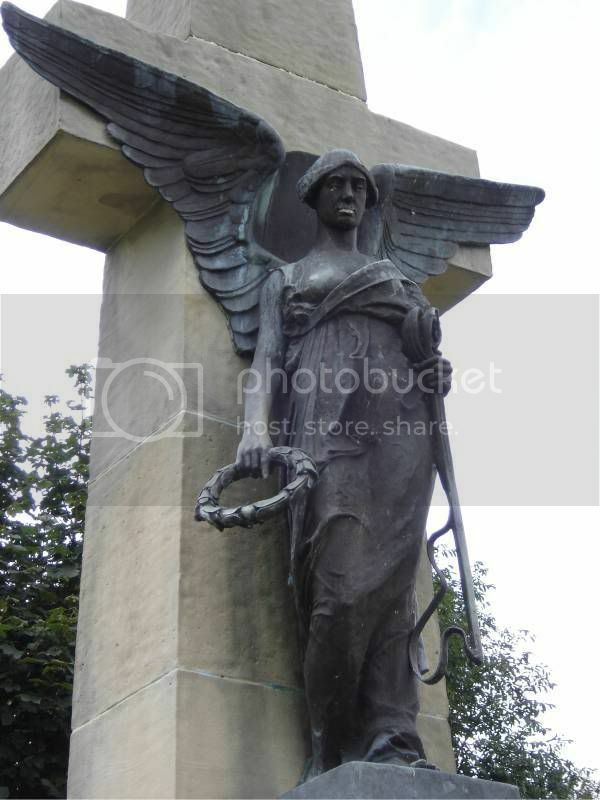 “Is it the Goddess of Victory that looks towards the town? If so, it breaks with the past conceptions. No longer, not now, with lips curled with contempt, arrogant, vibrant with the pride of human achievement and the elation of personal triumph, but with a face of intense thought, of profound concern, removed from grief, yet seeming to realise the cost of victory in human lives. Or is it the face of the Goddess of Peace that steadily looks upon the present traffic of living men, and will look upon the generations that follow? If so, then she seems to be still weighing vital issues – perchance that her power is threatened in the future that she cranes forward to pierce. 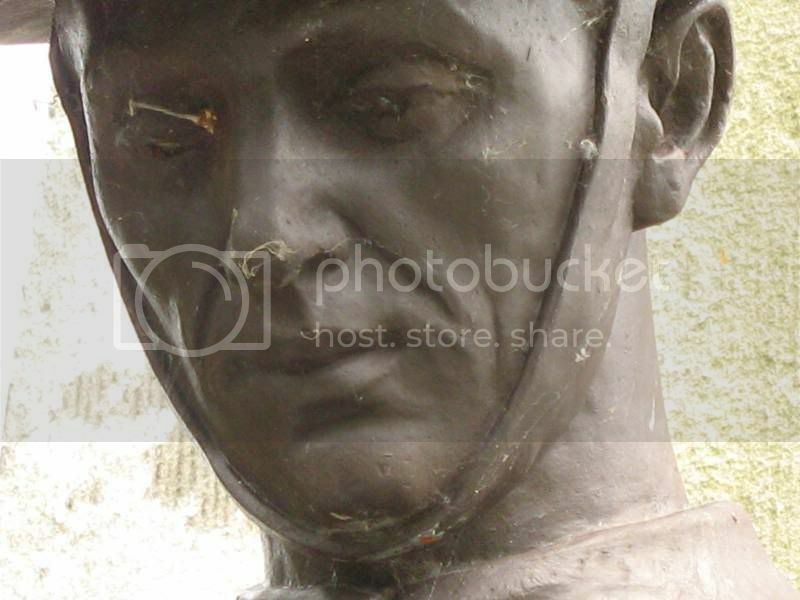 The face is strikingly arrestive, and in no part of the sculptuory has the artist been more successful. The more one looks at it the more one comes under its spell. It stirs, it holds one. 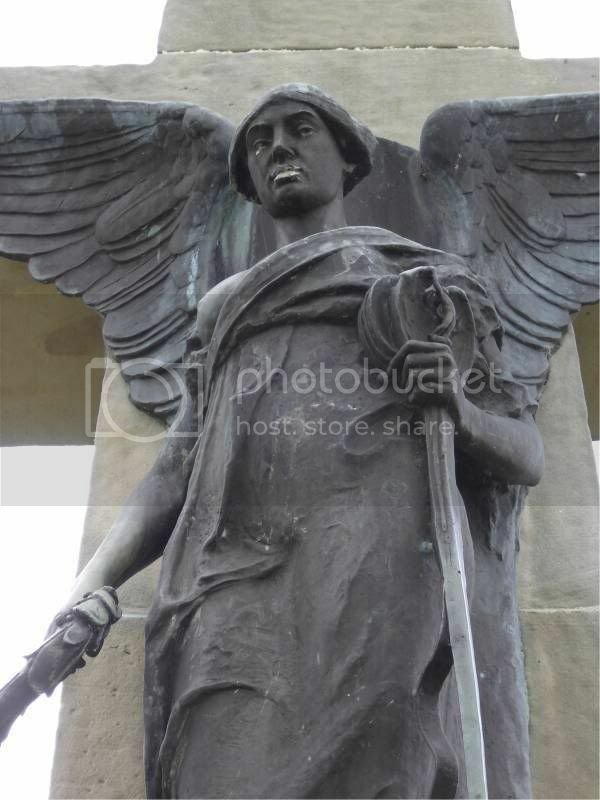 “In the conception of the statue, be it the genius of victory or peace, there are other significant meanings. In its half-kneeling posture, the figure suggests a success wrested, when almost beaten down, from a deadly adversary. On the left there is a sheathed sword, the handle un-grasped, the scabbard piercing the ground and wreathed with its sling – now the emblem of disuse. On the right side is a small round shield, the boss outermost, resting on the ground and against the drapery of the figure. In the reversed position of these arms there is an obvious meaning. It contrasts with the alert poise of Minerva, the Goddess of War in classic art, with ready spear in the right and shield in the left hand. “The Goddess offers in her right hand the smaller figure of a victory, standing lightly upon an orb representing the earth. 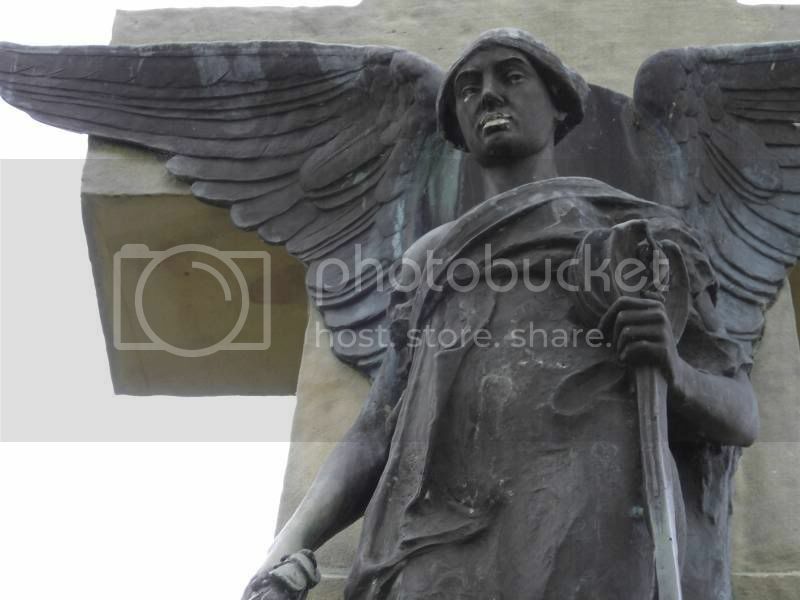 It is a winged piece, its moulding delicate, from the brow to the feet, tense, vivid, depicting radiant youth and life, and the glory of its errand, as with outstretched wings it eagerly flies abroad proclaiming its message – Victory. Just looking at Kellock Brown's other work. 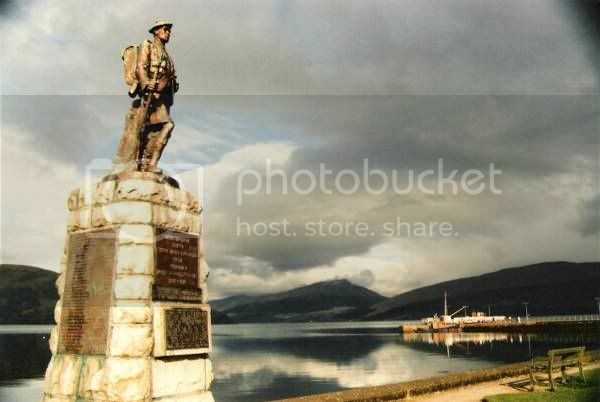 It suggests earlier pieces were all on the same theme - army/infantrymen. The only work 'similar' in style to Alyth would be Dalry, 1927 - much later. However, I'm sure Alyth was 1921. Any thoughts on why he would completely change style etc. at this point. 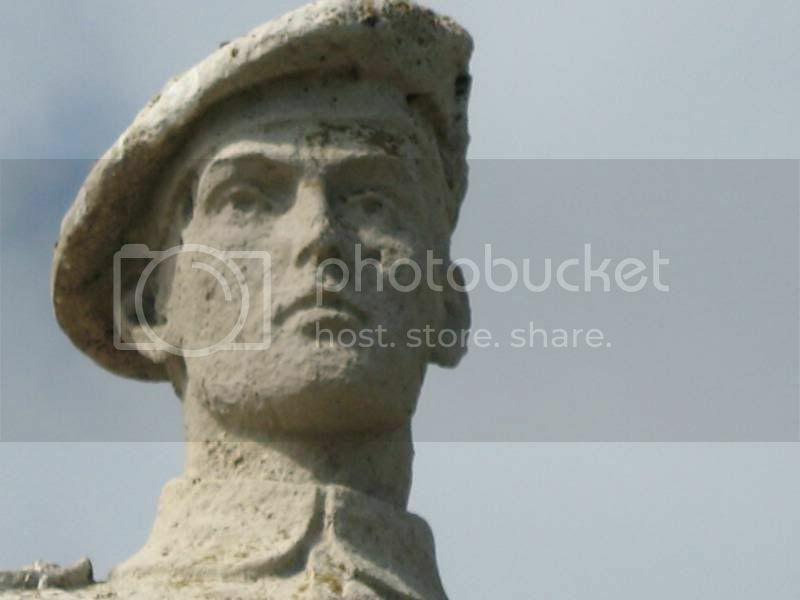 Also strange that the Alyth memorial doesn't have a mention in your files. Perhaps you could point me in the right direction. This seems to suggest the figure was cast in Belgium - any thoughts on that? 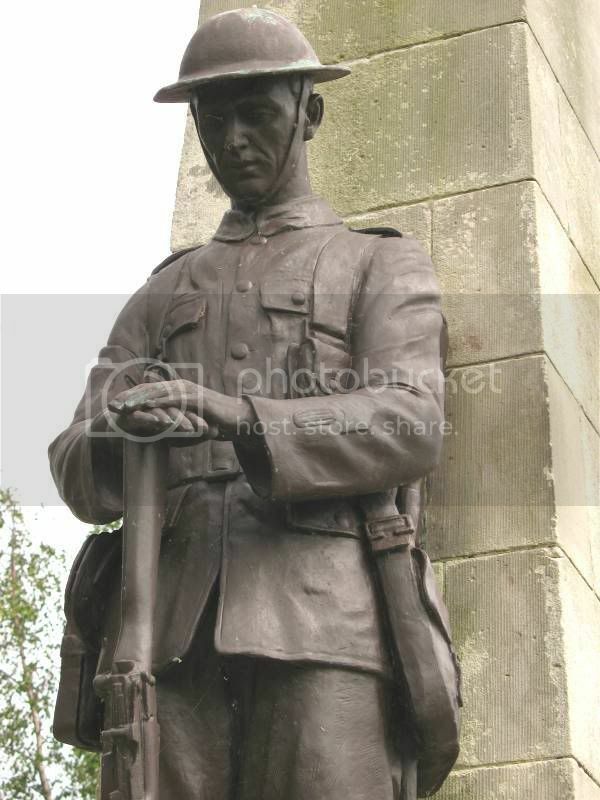 It might be worth trying to get close up photographs of his other soldiers from different angles. 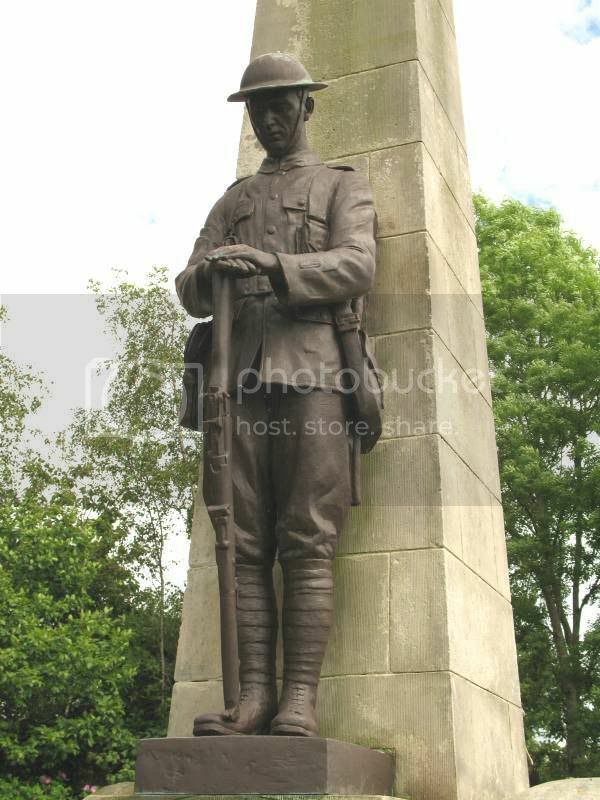 By looking at the left sleeve of the Penpont / Kilmaurs figure he has added a wound stripe and overseas service stripes. Perhaps there are other little details on these other figures which we can't see on the photographs we have. The chevrons are good conduct stripes. The number ( looks like three although difficult to make out ) appears to show a Regular with 12 years service. The Overseas Service Stripes were smaller and to be worn on the right sleeve. I believe it was possible to have seven in total, one red and six blue. You're right, the overseas chevrons were worn on the right sleeve. Looking at the Penpont memorial though I think these are supposed to represent the overseas chevrons rather than long service. They are in proportion for the overseas chevrons, long service chevrons would go across the whole sleeve. 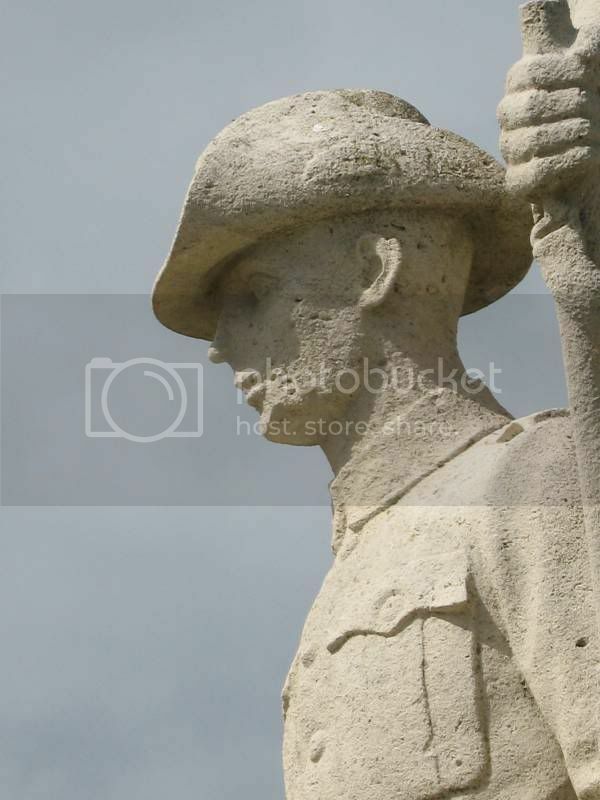 I've borrowed this image from the Diggerhistory website who have scanned it from an Osprey Men-at-Arms book. You can see the man on the left has both sets of stripes. The sergeant stripes inverted would be the long service stripes, the overseas chevrons are at the cuff of his sleeve. I think Kellock Brown's chevrons are supposed to represent the latter but he's put them on the wrong arm. The Digger image has gone AWOL. I tend to agree they appear to be too small for good conduct stripes, and technically incorrect. I wonder what, in anything, is on the left sleeve, which is clearly visible. You mention this is Penpont. From the order of the post I took it this was Kilmaurs with Penpont not shown in detail. Either way, I wonder if the other is identical on the left sleeve. Looking again you're right it is Kilmaurs I've used above. It was on the Penpont memorial I noticed the wound stripe so I'm assuming that as they are probably copies that Penpont has the same detail. I'm also assuming the left sleeve on Kilmaurs has no detail on it or Paul would have photographed it. It would be good to get some close-ups of Penpont to see if they are exactly the same. 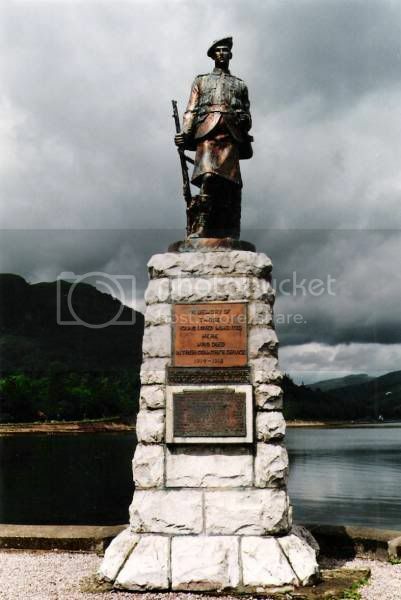 The same applies to the Johnstone / Inveraray Highlander. 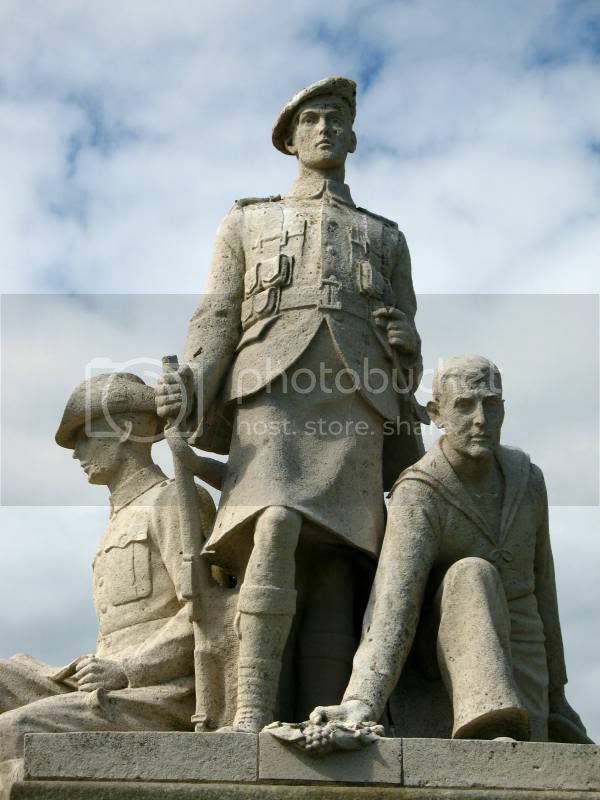 It would be interesting to see if the bronze versions have more detail than the stone one at Largs.